Chris began his career at Darlington as a trainee, before signing a professional contract prior to the 1989/90 season. After failing to make an appearance that season, he signed for Nottm Forest in July 1990 where he stayed for two years, again failing to break into the first team. It was during his time at Forest that he went on loan to Kettering Town during the 1992/93 season, scoring 3 times in 23 appearances. His form attracted the attention of Scunthorpe United, and he moved to Glanford Park in the summer of 1993 for a £50,000 transfer fee. He made some 336 appearances in seven seasons, including 177 successive games. In May 2000, he was lured away by Gillingham, who paid a £250,000 fee for his services. 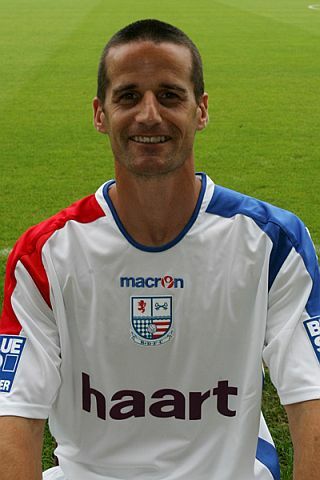 In five years with the Kent side, he notched up 264 appearances taking over the captaincy for the 2005/06 season. The following year was marred by injury, and he was released in May 2006, joining Diamonds on 7 July on a two year deal. Described as a leader on and off the pitch, Hope played a major role in his first season at Nene Park, winning players player of the season, and continued as club captain in 2007/08, earning a place on the retained list for 2008/09 which will allow him to combine playing duties with a coaching role. In his career with the Diamonds prior to the 2008/09 season he had appeared in 101 games, scoring 6 times. During the 2008-09 season he started all 46 league games, the first player in Diamonds history to achieve that feat in a 46 game season, and completed the full 90 minutes in 45 of these games. His performances during that season, including 5 league goals, won him the Evening Telegraph Player of the Season award, the Press Box player of the Season award and the Internet Forum’s Player of the Season. He also remains on the Management Committee of the Professional Footballers’ Association. He was released in May 2009, and was going to join Dover Athletic before deciding to remain in the Northants area. He joined Conference North side Corby Town on 1 June 2009, but was released by the club on 1 March 2011. Although he planned to join Oxford City for the rest of the season, the move never took place. On 24 July 2011, he joined Southern League Division One Central side St.Neots Town after playing in a couple of pre-season friendlies for the Saints, helping them to promotion at the end of the season. On 21 July 2012, Chris joined the newly formed UCL Division One side AFC Rushden & Diamonds. After helping Diamonds to promotion into the UCL, Chris took a break from the game to concentrate on coaching, before joining UCL Division One side Thrapston Town on 28 February 2014, scoring twice on his debut the following day. He continued playing beyond the age of 42 before concentrating on his coaching role.